I know I'm not alone when I say that I'm so looking forward to some warmer spring days! Well, until we get there, let's focus on some cheerful cards, like today's two projects featuring the Vibrant Vases stamp set and more of the black & white Botanical Butterflies Designer Series Paper! Print of the FREE Project Sheets to help get you started! Enjoy A 20% Discount—When you purchase either Starter Kit, you can enjoy a 20% off discount off your future Stampin' Up! orders! Plus, you'll have lots of perks for being a Too Cool Stamper...see my team benefits page! Created by Rhonda Morgan at INKin' All Night. 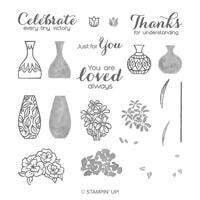 The Vibrant Vases stamp set is so sweet and it's designed to coordinate with the Vases Builder Punch and the original Vivid Vases stamp set for lots of versatility! These adorable bouquets are sure to bring a brighter day to the recipient! Score 8-1/2" x 5-1/2" Pool Party card base at 4-1/4”, fold in half to create card base. Adhere the 4" x 1" Botanical Butterflies DSP to the 4" x 1-1/4" Basic Black layer. 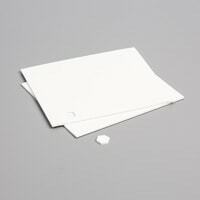 Adhere to a 4" x 5-1/4" Whisper White panel layer about ½” above the bottom edge. 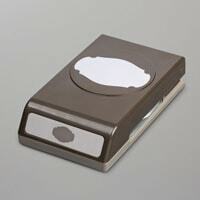 Stamp the Strong & Beautiful greeting onto the Whisper White panel layer using Memento Black ink, (leaving room for the vase). Onto Whisper White scrap cardstock, stamp the vase with Pool Party; stamp the outline floral image with Memento Black; stamp the inside leaves with Granny Apple Green and the inside flowers with Melon Mambo. Punch out the vase with the Vase Builder punch. Hand-cut out the flower shape. Repeat and trim one flower from the image. 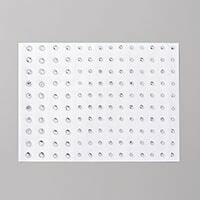 Assemble the vase and flowers together with Mini Glue Dots and then attach with Dimensionals to the card. Use Mini Dimensionals to add the extra flower. This second Vibrant Vases card features a full backdrop of the gorgeous black & white gingham from the Botanical Butterflies DSP. 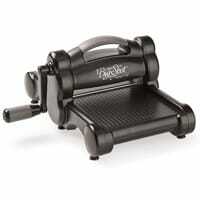 Remember, you can earn this DSP for FREE with you place a $50 order at www.toocoolstamping.com by March 31. 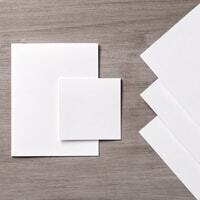 Score 8-1/2" x 5-1/2" Whisper White card base at 4-1/4”, fold in half to create card base. Adhere the 4" x 5-1/4" Botanical Butterflies DSP to the card base. With the 2nd largest Stitched Circle and the tag from Stitched Labels and a 3”x4” piece of Whisper White, run through Big Shot and die cut both pieces. 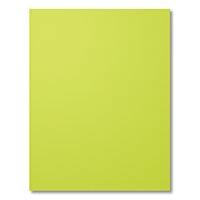 With the 3”x4” piece of Whisper White, stamp the vase with Pool Party, the leaves with Granny Apple Green. 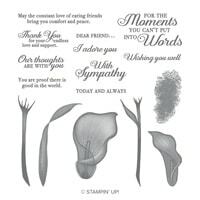 Stamp the outline image of the tulips with Memento Black and then the inside tulip image with Gorgeous Grape. 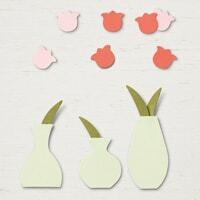 Punch all shapes with the Vase Builder punch. Assemble the vase and flowers and tulips with Mini Glue Dots and Mini Dimensionals; then adhere to the circle with Dimensionals. 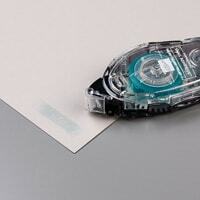 Adhere the greeting tag with Dimensionals. 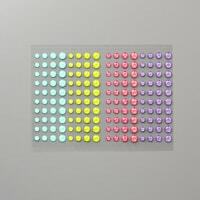 Add a few of the Gorgeous Grape Glitter Enamel Dots. Are You A Fan of the Vibrant & Vivid Vases Sets? 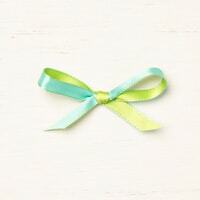 Earn FREE Sale-a-Bration Items with a $50 Order! My February "Last Thursdays" Monthly Card Class is coming up this week on February 28! If you're in the Fort Wayne, Indiana area, please join us! 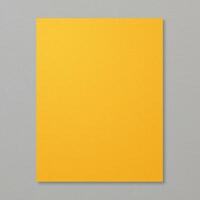 Today, I'm sharing one of the cards that we'll be creating at the event. It's quick and easy and bright and cheery! 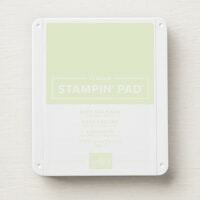 Too Cool Stamping, select 5 FREE Cards from my fully stocked Card Rack! Beginners welcome! 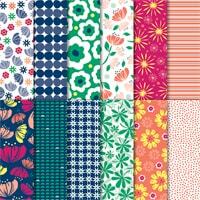 I love the clean, bold images in the Bloom By Bloom stamp set. We'll be stamping these pretty single blooms with the sentiment of your choice at my "Last Thursdays" class this week. I received the first card as a swap from Sandy Carlson, and I CASEd her layout for the second card. Stamped Bloom—Sandy started by adhering a 1-1/4" x 5" strip of Happiness Blooms Designer Series Paper to a 3-3/4" x 5" piece of Whisper White cardstock. Then, she stamped the Bloom By Bloom flower next to the DSP. The flower was stamped first in Lovely Lipstick ink, then the stem in Call Me Clover ink, then the dots above the flower with Night of Navy ink. She finished up with a sentiment from the Love What You Do stamp set in Lovely Lipstick ink. Lovely Layers—Sandy completed the card by mounting the stamped layer onto a 4" x 5-1/4" layer of Lovely Lipstick cardstock. 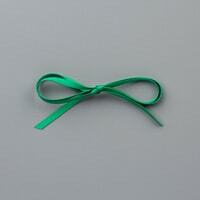 The Lovely Lipstick 1/8" Grosgrain Ribbon was wrapped around the layer and tied into a double-knot. It's mounted onto a NIght of Navy card base. So simple and pretty! Two Cool—I created a second card with similar elements, although I still like Sandy's better! 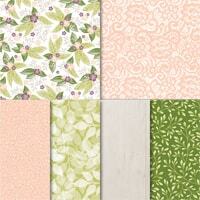 I select another small floral pattern from Happiness Blooms DSP for the side, then stamped the bloom in Calypso Coral. The sentiment is from the Birthday Cheer stamp set. Layered Finish—I adhered the stamp piece onto a 4" x 5-1/4" layer in Petal Pink, tied some Call Me Clover ribbon around the layers and mounted it onto a Calypso Coral card base. 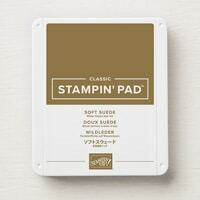 This is such a quick card that it would be perfect for mass-producing—stamp a stack! Do You Like These Bold Blooms? 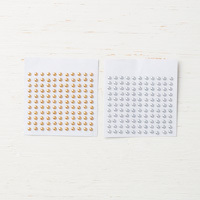 I wasn't sure whether I would like the All Adorned Sale-a-Bration 2nd Release stamp set because, truthfully, the images by themselves seemed a little underwhelming. But once you layer them...WOW! It's definitely one of those stamp sets that you have to play with to fully appreciate! Designed with the Stamparatus in mind, these intricate photopolymer images layer beautifully and visually link together to create lovely borders and backgrounds! I enjoyed creating today's cards so much and can't wait to try the images in even more color combinations! I created this card design for my Too Cool Team make & takes last week and was surprised at how quickly everyone stamped this seemingly complicated pattern. Stampin' Up! makes it easy, once again! 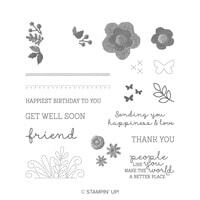 Enjoy the card details below and earn this All Adorned stamp set for FREE with a $50 purchase from my Online Store! The intricate geometric images in the All Adorned Sale-a-Bration stamp set layer to create marvelous medallions! 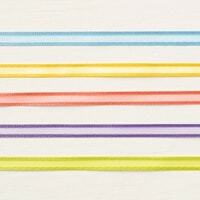 I had some fun playing with different color combinations on this linked border layout. 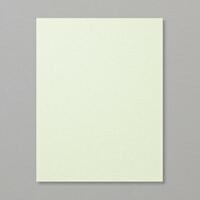 Background Basics—This card begins with a 4-1/4" x 2" strip of Painted Seasons Designer Series Paper mounted onto a Lemon Lime Twist card base. 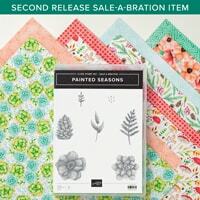 You can earn the DSP as part of the Painted Seasons Sale-a-Bration Bundle when you place a $100 order through March 31. Start by stamping the largest image in the center of the strip in Bermuda Bay ink. Stamp the medium round design over the top in Balmy Blue, lining up the 4 dots inside the 4 circles of the previous stamped image. Stamp the small linking circle in Lemon Lime Twist on the top and bottom of the medallion. Repeat stamping the large and small medallion layers on the top of the strip and bottom of the strip. Awesome Accents—I colored three large Rhinestone Jewels with the Dark Granny Apply Green Stampin' Blends Marker and added them to the centers of the medallions for some sparkle. Sparkly Sentiment—I stamped the All Adorned sentiment in Bermuda Bay ink onto Balmy Blue cardstock, then punched it out with the new Story Label Punch that will be available for a limited time in March. Check out the sparkle on the word "best." I brushed on some Wink of Stella to draw attention to that word and create some balance with the jewels. 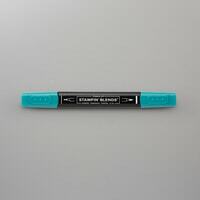 I love this subtle shimmer! The sentiment is popped up with Dimensionals onto the card front. 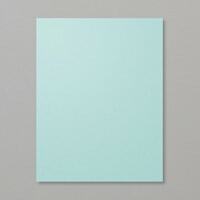 Two Cool—I couldn't wait to try out different color combinations for this card! This time, I used a Poppy Parade pattern from the Painted Seasons DSP and mounted it onto a Petal Pink card base. Pretty Border—This border begins with a Poppy Parade large design, Mango Melody medium design and Petal Pink small linking circle. The jewels were colored with the Dark Poppy Parade Stampin' Blends. Sparkly Sentiment—I stamped the sentiment in Poppy Parade onto a Mango Melody Story Label shape and added that Wink of Stella shimmer. Three Cool—Ready for one more? 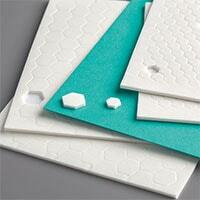 This time I paired the Pool Party pattern from Painted Seasons DSP with a Soft Sea Foam card base. Lovely Layers—I stamped the large image in Highland Heather, the medium shape in Pool Party and the small circle link in Soft Sea Foam. I added colored Rhinestones altered with Dark Highland Heather and Dark Bermuda Bay Stampin' Blends Markers. Sweet Sentiment—This last one has a Highland Heather sentiment stamped onto a Pool Party label. I demonstrated how to stamp and assemble this card during my 2nd Release Sale-a-Bration sneak peek Facebook LIVE video. Here it is in case you missed it! What 3 Medallion Colors Should I Try Next? I had the opportunity to attend a wonderful stamping event over the weekend with dozens of my fellow demonstrators! I love being able to hang out with amazing leaders to learn and be inspired! I also love the chance to TAKE some card classes rather than just MAKE the card classes! It was so fun and relaxing and rejunvenating! Today, I'm sharing a couple of cards that we created at the event featuring the beautiful Lasting Lily stamp set! If you saw my Facebook LIVE sneak peek last week, than you know that we'll soon be getting NEW framelits that coordinating with the Lasting Lily Sale-a-Bration set, coming in March! Designed by Ronda Wade at Creating Success. 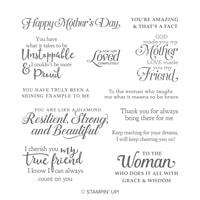 The Lasting Lily stamp set is a Sale-a-Bration item that you can select for FREE with an order of $100 or more from now thru March 31, 2019. The elegant calla lily images look amazing when they are teamed up with the gorgeous patterns in the Floral Romance Designer Series Papers! I love the soft colors and thoughtful sentiments on both of these cards! 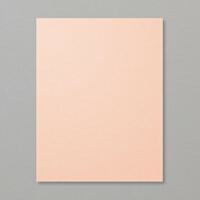 Background Basics—I adhered a 4" x 3" piece of the pretty Petal Pink vellum onto the front of a Thick Whisper White card base. Pretty Lilies—I stamped the Lasting Lily blooms in Petal Pink onto a 3" x 4" piece of Whisper White, then stamped the stems and leaf images in Soft Sea Foam. 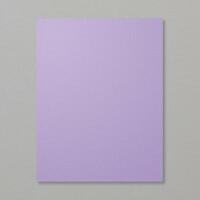 It's layered onto a 3-1/4" x 4-1/4" piece of Petal Pink. I tied some of the Petal Pink/Whisper White 5/8" Variegated Ribbon around the layers and tied them into a double knot before popping the whole thing up with Dimensionals onto the card front. Sweet Sentiment—I stamped the Lasting Lily sentiment onto a Whisper White Rectangle Stitched Framelits die-cut and popped that up, as well. Finishing Touches—I finished by adding a few Basic Adhesive Backed Sequins in Soft Sea Foam. So, so pretty! Two Cool—The second card begins by adhering a 2" x 5" piece of Floral Romance DSP to a 4" x 5-1/4" layer of Whisper White. It's mounted onto an Old Olive card base. Lovely Lily—I stamped the Lasting Lily flower in Blushing Bride ink onto a Whisper White Stitched Shapes oval die-cut, then added a stem in Pear Pizzazz. 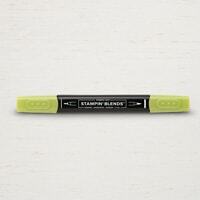 The sentiment is stamped over the stem in Old Olive ink. It's all mounted onto a scalloped oval die-cut, cut with the Layering Ovals Framelits, then popped up with Dimensionals onto the card front. 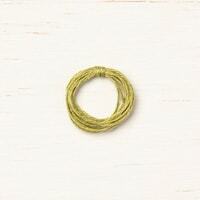 Finishing Touches—I tied a double-bow with the Old Olive Linen Thread and attached it with a Glue Dot. I also added some Petal Pink Basic Adhesive Backed Sequins floating around the focal point. 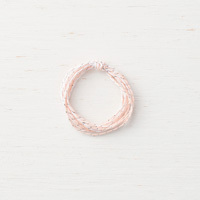 Are You Loving Petal Pink & Soft Sea Foam, Too? Today I'm sharing another card that we'll be creating at my 20-Card Kickoff Party! Registration for the Ultimate NEW Catalog Kickoff Party closes in just 3 DAYS, on Monday, January 14. If you're in the Fort Wayne, IN, area, this is a must-attend event where you can play with DOZENS of new products! I only have a handful of spots remaining, so don't delay! 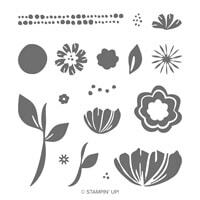 The big bold flowers in the Bloom By Bloom stamp set are perfect for quick & easy focal points! You don't need a lot of layers...just build the flowers with stamps & ink for a cheerful card! We'll be creating the Night of Navy card at the Kickoff Party! Background Basics—I began by embossing a 4" x 5-1/4" piece of Night of Navy cardstock with the NEW Dot To Dot Texture Impressions Folder. 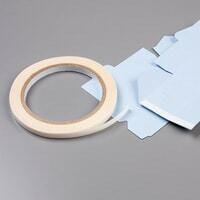 I adhered it to a Night of Navy card base with a combination of Tear & Tape and SNAIL adhesives for a secure hold. 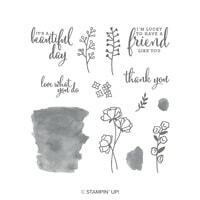 Fresh Focal Point—We have so many flower stamp sets that are great for coloring, so I adore that this one is different and all about basic ink-to-paper stamping! 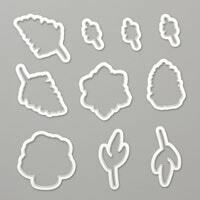 Bloom By Bloom is a two-step stamp set, which means that you stamp with separate elements to create the completed image. 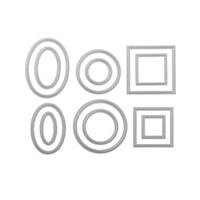 It's easy to position each part of the image with the see-thru photopolymer stamp style. I started with a 3-1/" x 4-1/4" piece of Whisper White cardstock and found that it helps to stamp the elements in a particular order to allow for appropriate spacing. Stamp the larger flower in Calypso Coral in the upper right corner at a slight slant, leaving enough room to add the dots above it later. Stamp the coordinating large stem in Call Me Clover, leaving room for the second flower. 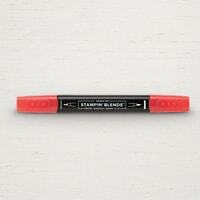 Stamp the small flower in stamped-off Calypso Coral ink next to the large flower stem. 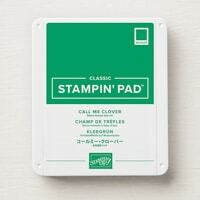 Stamp the small stem in Call Me Clover. 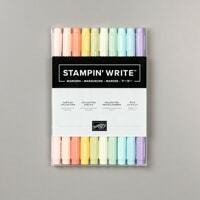 Stamp the sentiment in Night of Navy ink in the upper left corner. 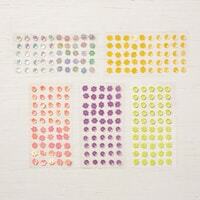 Stamp the dots over each flower in Night of Navy ink. I added a 3-1/2" x 1/2" strip of the striped pattern from the Happiness Blooms Designer Series Paper pack along the bottom edge, then popped up the layer with Dimensionals onto the card front. I'm not normally a "tilted" focal point person, but I really liked the look of this at an angle. 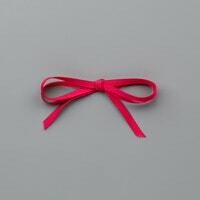 Bitty Bow—I finished the card by adding a Silver & Petal Pink Baker's Twine bow with a "pinched" Glue Dot onto the larger flower. So sweet! Two Cool—My second version Calypso Coral embossed layer and card base. 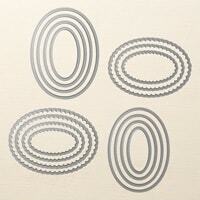 I flipped the Dot To Dot texture so that the recessed side was facing up...I tend to enjoy the recessed look better! Which texture side do you like best? This time, I added the sentiment at the bottom of the focal point and stamped off once for the larger flower. I also moved the bow to the bottom border to accentuate the greeting. 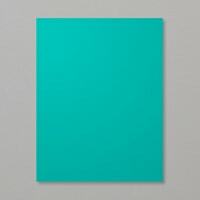 This card design looks great in the Calypso Coral color combination, but I really LOVE the way that the Navy card pops! What Color Would You Stamp These Bold Blooms? 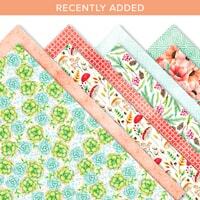 Oh, I'm having the best time playing with the NEW Occasions & Sale-a-Bration items! How about you?! 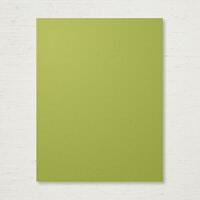 Today, I'm sharing a card that we'll be creating at my 20-Card Kickoff Party! Registration for the Ultimate NEW Catalog Kickoff Party closes in just 5 DAYS! If you're in the Fort Wayne, IN, area, this is a must-attend event where you can play with DOZENS of new products! And, don't forget to join me on Thursday for a Too Cool Stamping Facebook LIVE! Join Me For A Too Cool Stamping Facebook LIVE! Thursday, January 10, 9am ET or Watch The Recording Anytime! I'll be sharing two cool project ideas, talking about Sale-a-Bration & having a Prize Giveaway! Find It At My Too Cool Stamping VIP Group! Request To Join My VIP Group Now! It's FREE! I wasn't sure about the Needlepoint Nook suite at first, because I don't sew or do any embroidery. But, those Needlepoint Elements Framelits and the lovely stitched pattern die totally sold me! 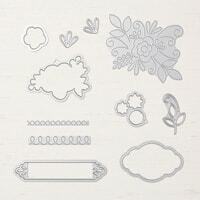 It has the look of the Quilt Top Embossing Folder stitching in a pretty floral pattern. I couldn't wait to try it out on this 2019 Kickoff Card design! Background Basics—I started by running that Needlepoint Element floral stitching die through the Big Shot on a 5-1/4" x 4" piece of Coastal Cabana. 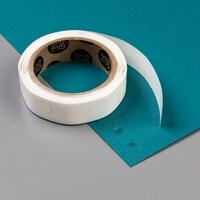 I adhered the layer onto a Coastal Cabana card base. Eeeee! I mean look at that awesome stitched pattern...I LOVE it so much! SO VERY MUCH!!! Pretty Focal Point—The NEW Stitched Rectangle Framelits complement the stitched background perfectly. 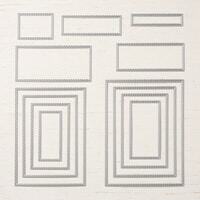 I die-cut a 3-5/8" wide Whisper White rectangle for the focal point layer. I stamped the larger Needle & Thread flower in Coastal Cabana, then stamped the smaller flower directly over the center of the image in Pacific Point ink. I love that two-tone look! 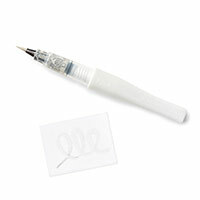 Dis-INK-tive Stamps—The image is a Dis-INK-tive stamp, which means extra-detailed and it looks like actual embroidery floss! Do you ever have trouble stamping the detailed Dis-INK-tive stamps? 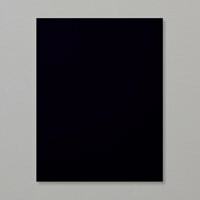 Sometimes, when an ink pad has lots of ink in it, like right after it's re-inked, the extra ink fills in the crevices of the images, so you end up with a big, blurry blob! Scroll down for my Too Cool Tip of the Week for a quick & easy solution for achieving crisp, clean images every time! I added two Needle & Thread leaves in Granny Apple Green ink on either side of the flower. I finished by adding a sentiment from the same set in Pacific Point. Finishing Touches—I adhered a small piece of folded the Coastal Cabana/Granny Apple Green 3/8" Reversible Satin Ribbon on the back of the stamped layer, then popped the piece up onto a 3-7/8" x 1-7/8" piece of Pacific Point cardstock with Dimensionals. It's mounted onto the card front with SNAIL adhesive. Finally, I added a few of the iridescent Gingham Gala Adhesive-Backed Sequins for some sparkle and shine. I love mixing elements from different suites of products and I love that they come together with perfect coordination! 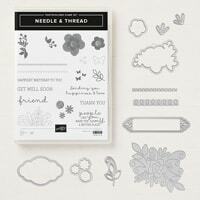 Bundle It & SAVE—Purchase the Needle & Thread stamp set and Needlepoint Elements Framelits together in a Bundle to save 10% off the cost of purchasing them separately. Two Cool—My second version tries out a different color combination with the same card design. 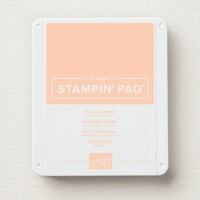 The background stitched pattern was added to a Petal Pink layer and mounted onto a Petal Pink card base. Focal Point—The flower was stamped in Petal Pink for the larger flower and Calypso Coral for the center smaller flower. 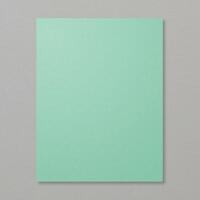 The leaves were still in Granny Apple Green and the sentiment was in Calypso Coral. 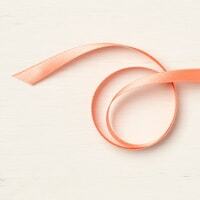 Finishing Touches—This time, I used the coordinating Calypso Coral 3/8" Satin Ribbon under the stamped layer. It's mounted onto a Calypso Coral mat with Dimensionals, then added to the card front. I finished with the Grapefruit Grove color of Gingham Gala Sequins. I love how the colors of the sequins easily coordinate with similar colors, giving them lots of versatility! Your Kick-Off Party Goodie Bag—Each one of my party participants will receive $16 worth of NEW Occasions products and this card features two of them: Calypso Coral 3/8" Satin Ribbon & Gingham Gala Adhesive-Backed Sequins! You'll use a little bit of your goodie bag items on the projects, then take the remaining home to use on your own projects! Too Cool Stamping VIP Facebook Group—Request to join here. Too Cool Stamping Pinterest Page—See it here. My Weekly Email Newsletters—Subscribe on the left column of my blog page. Is Needlepoint Nook One of Your Favorite Suites? 4 Days Until We Sale-a-Brate & It's A Butterfly Gala! We are down to just 4 Days until Sale-a-Bration! All of the fun begins January 3 and runs thru March 31, 2019! Today, I've got a couple of projects featuring my favorite Sale-a-Bration product, including a video to show it in action! Plus, don't miss my Occasions Paper Share and my annual Kickoff Party information, just announced this week! 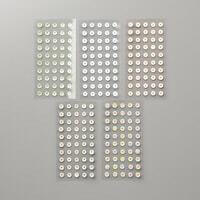 Get Your Occasions Catalog Wish Lists Ready! It All Starts In Just 5 MORE DAYS! If you like butterflies, you are going to LOVE the Occasions Catalog & Sale-a-Bration Flyer! Butterflies are BACK and are better than ever! Today's projects showcase a few of my favorite NEW butterfly-themed products! 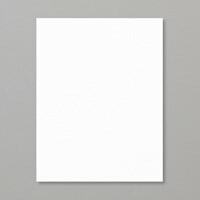 Background Basics—Our card begins with a Thick Whisper White card base, then we start decorating with some of the lovely NEW Botanical Butterflies Designer Series Paper. 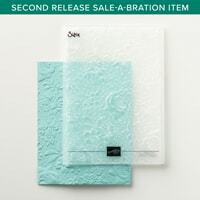 This awesome paper pack is a FREE selection from the Sale-a-Bration Flyer when you place a $50 order! Get a sneak peek at it in my video tutorial below! I added adhered a 1-1/2" x 5-1/2" strip of the Botanical Butterflies black & white gingham pattern onto the card front. Next, I mounted a 2-3/4" x 3-3/4" piece of the Botanical Butterflies Highland Heather design DSP onto a 2-7/8" x 3-7/8" Basic Black mat. I popped up that element with Dimensionals. Sweet Sentiment—I stamped a sentiment from the NEW Butterfly Gala stamp set in Granny Apple Green onto Whisper White cardstock, then die-cut it with the Stitched Shapes Framelits. I popped this up with Dimensionals, as well. Beautiful Butterflies—The NEW Butterfly Gala photopolymer stamp set and coordinating Butterfly Duet punch allow you to create pretty & colorful butterflies in minutes! I stamped the outline image of the butterfly duet, which includes both the large and small butterflies, in Memento Black Ink onto Whisper White cardstock. 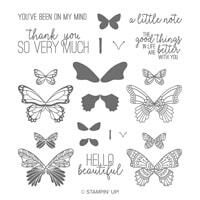 The stamp set is a "two-step" one, meaning that you can fill in the color on the butterfly with a coordinating solid image. There are stamps that will fill in the top wings and the bottom wings. I inked both up with Pool Party ink, stamping the entire butterfly in one color. But, I wanted a multicolor look, so I used Granny Apple Green and Highland Heather Stampin' Write Markers to add some additional colorful details! Cool Coordinating Punch—Once my butterflies were colored, I punched them with the coordinating Butterfly Duet Punch, which punches out both the large and small butterflies at the same time! Too Cool! The large butterfly was attached with SNAIL and a Dimensional. 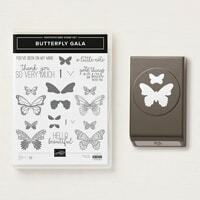 Bundle It & SAVE—Purchase the Butterfly Gala stamp set & Butterfly Duet Punch together in a Bundle to save 10% off the cost of purchasing them separately. Butterfly Bodies—I learned that it's much easier to add the Basic Black butterfly body stamps to the butterflies AFTER they are punched. They are photopolymer, so you can see right through the stamp in order to line it up in the punched out shape. 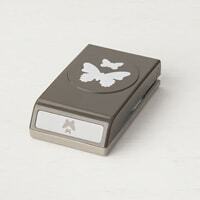 There is a large body stamp for the large butterfly and a small one for the small butterflies. Finishing Touches—I added some silver Metallic Pearl jewels to the four points on the flourish. Tiny Butterflies—The small butterfly has a single solid image that fills the outline with color. I colored one of the small butterflies like the large one. On the second small butterfly, I stamped it with the solid image in Soft Sea Foam, then colored the accents with Balmy Blue & Highland Heather Stampin' Write Markers. Both small butterflies are attached with a Glue Dot and the wings are bent upward so they appear to have alighted onto the card! LOVE it! Finishing Touches—I added a couple of silver Metallic Pearls to the sentiment circle for a little shine. Two Cool—The second card features a Lemon Lime Twist pattern for the background foundation. 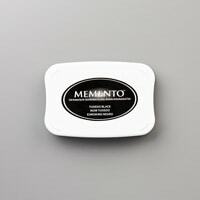 I also stamped the sentiment in Memento Tuxedo Black. Bitty Butterflies—These butterflies all started with a Daffodil Delight solid stamped fill, then they were colored with Granny Apple Green and Pumpkin Pie Stampin' Write Markers. 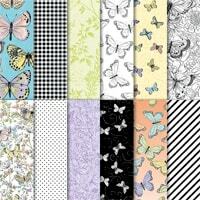 I had butterflies in similar colors on my bedroom border wallpaper when I was growing up! Ahhh...memories! Are You Excited About The Return of Butterflies? Ahhh! It's good to be back to blogging! I had to take a few days off to recuperate after a planned foot surgery last Friday to remove a bone spur. The surgery itself was very quick and successful, but I mistakenly thought that I'd be able to jump back in and resume my blogging schedule right away. Haha! I've felt pretty good, with only minimal pain & discomfort. But I've discovered that, even with a laptop, it's not easy to work when you have to have your foot raised above your heart to keep the swelling down! I'm so very thankful for this lovely contraption that has kept me tethered to my recliner. It's a wrap that pumps cold water around my foot so that I don't have to bother with changing out ice and possibly getting my bandage wet. I also have compression wraps on both legs to keep the blood circulating while I'm off my feet. It's all helping me heal much faster and giving me a really great excuse for napping! I've been amazed at how well I'm able to walk around with the help of my new designer surgical boot! I can hobble along pretty quickly already and I'm sure I'll be a pro after walking in it for the next month. For now, I'm just trying to get used to my restricted movements and my inability to drive, while practicing patience. My husband has been so wonderful...taking such good care of me and my doggers, Jax & Millie! OK, let's get back to business! Today, we've got new Clearance Rack items, the last day to save 15% with my Anniversary special and a sneak peek of some new Sale-a-Bration items! Let's go...! Clearance Rack Refresh! Dozens of Items Added! Too Cool Stamping's 15th Anniversary Special! LAST DAY To Save 15%! Ends December 18! I'm offering an exclusive 15th Anniversary Special just for my Too Cool Stamping customers! Place an order now thru December 18, 2018, and I'll mail you a rebate check for 15% of your retail merchandise total (before shipping & tax). There is no minimum order required! You can shop regular merchandise, Year-End Closeout items, Clearance Rack and even Paper Pumpkin pre-paid subscriptions! 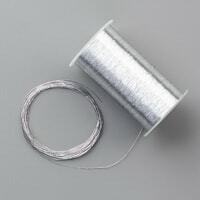 Online orders MUST apply the HOST CODE Z3U4NKHE at the bottom of the Shopping Cart page, or simply email your order directly to me. Rebate Check will be mailed out on December 19 for qualifying orders. Not valid on previous orders, or as part of a workshop or class order. This is my exclusive offer and is not affiliated with Stampin' Up! or any other demonstrators. LAST DAY For My Online Craft Fair Boutique! 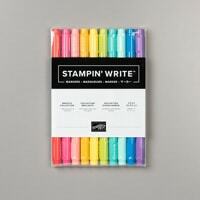 Shop for all kinds of "Too Cool" stocking stuffers, treat holders & more! See details on how it works and what's for sale here. Today, I have four sneak peeks from the upcoming Occasions Catalog and Sale-a-Bration promotion, which starts January 3! Check out the photos below, plus a video showing the sneak peak products in more detail! Background Basics—This card begins with a 2" x 5-1/4" strip of Grapefruit Grove gingham paper from the new 6x6" Gingham Gala Designer Series Paper. The pack comes with small & large gingham patterns in Grapefruit Grove, Highland Heather, Daffodil Delight, Lemon Lime Twist & Balmy Blue. See it up close in the video below. I adhered the gingham to a Grapefruit Grove card base. I also embossed a 2" x 5-1/4" piece of Grapefruit Grove cardstock with the Subtle Texture Impressions Folder and adhered it to the other side of the card front with Tear & Tape and SNAIL adhesives. 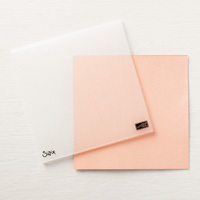 Stitched Rectangles—The focal point layer is stamped onto a 2-5/8" x 3-15/16" rectangle of Whisper White cardstock that has a pretty faux stitching around the edge. It's created with one of my favorite items from the Occasions Catalog...the Stitched Rectangles Framelits! If you like the look of the Stitched Shapes Framelits, you're going to LOVE the versatility of these new rectangles in all kinds of sizes! Plus, as a bonus feature, it creates the faux stitching on both the inside rectangle AND the outside frame window! See the video below for details! This is going to be a must-have for your die collection! 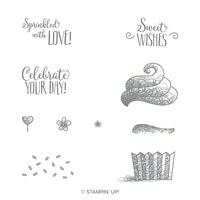 Hello Cupcake—The new Hello Cupcake stamp set has an adorable set of yummy cupcake images that will make your birthday cards so sweet! 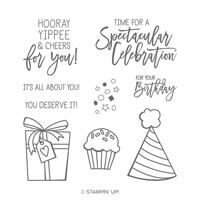 You can earn this stamp set for FREE with a $50 order during Sale-a-Bration, January 3 - March 31, 2019. I stamped the cupcake liner image in Soft Suede at the bottom first. Next, I added a thin cake image that nestles in-between the liner and the frosting images perfectly, inked in Grapefruit Grove. I stamped the Grapefruit Grove frosting swirl next, then added the sentiment on top in Soft Suede. You can see how these images fit perfectly together in the video below! Finishing Touches—I finished the stamping by adding a cute heart in Lovely Lipstick, then I added the layer to the card front with Dimensionals. 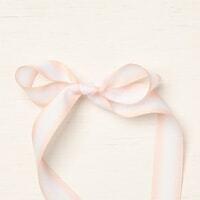 To top it off, I tied a bow with the new Grapefruit Grove Organdy Ribbon and adhered it with a Glue Dot. That ribbon is part of a special Sale-a-Bration ribbon combo pack selection, and it includes all of the colors that match the Gingham Gala DSP: Grapefruit Grove, Highland Heather, Daffodil Delight, Lemon Lime Twist & Balmy Blue. I'm loving that cool coordination! 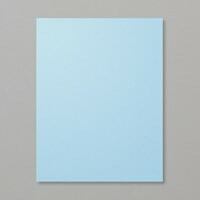 Two Cool—I did a second version in Highland Heather and it's just as sweet! 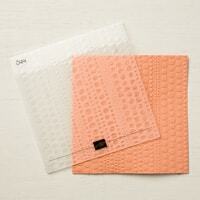 Notice that I featured the larger gingham pattern on this card, versus the smaller pattern on the first card. 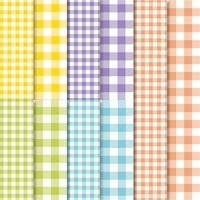 I love that you can choose which size of gingham on these double-sided papers! Cute Cupcake—I pretty much kept the card the same as the first one, just adding the coordinating Highland Heather ribbon and changing up the greeting to another sentiment from the Hello Cupcake set. Which color is your favorite? 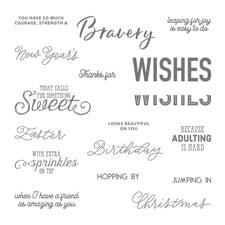 See The Sneak Peek Products In Action!—Watch the Hello Cupcake Gingham Cards video to see how to make the cards and get more details on the four new products coming this January: Gingham Gala DSP, Stitched Rectangles Framelits, Hello Cupcake stamp set & Organdy Ribbon Combo Pack. Links to Occasions & Sale-a-Bration items go LIVE January 3, 2019. Are You A Fan of Gingham?